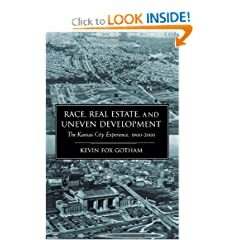 Race, Real Estate, and Uneven Development: The Kansas City Experience, 1900-2000 (9780791453780): Kevin Fox Gotham: Books. Traditional explanations of metropolitan development and urban racial segregation have emphasized the role of consumer demand and market dynamics. In Race, Real Estate, and Uneven Development: The Kansas City Experience, 1900-2000, Kevin Fox Gotham reexamines the assumptions behind these explanations and offers a provocative new thesis. Using the Kansas City metropolitan area as a case study, Gotham provides both quantitative and qualitative documentation of the role the real estate industry and the Federal Housing Administration, demonstrating how these institutions have promulgated racial residential segregation and uneven development. Gotham challenges contemporary explanations while providing fresh insights into the racialization of metropolitan space, the interlocking dimensions of class and race in metropolitan development, and the importance of analyzing housing as a system of social stratification.